My thoughts were, it’s just a hill…it’ll be fine…I can do hills…we live in Dorset…we’ve got hills! And do you know what… I can do hills 😀 (& continental hills are not that bad really) – not when you ride them like me anyway! So, mid-May saw 18 of us heading towards the village of Bedoin in the Provence-Alpes-Côte d’Azur region of south-eastern France to ride up Mont Ventoux – at a mere 1911m high & famous because of Le Tour de France. Don’t laugh – it works for me – the not uber-fit super human. The boys shot off – did I mention one of our party was a GB athlete? FINALLY I managed to overtake – it was getting embarrassing …. We met Nancy who was taking a gel break – she needed a bit of a push-off from Ian & Dave (who’d rocked up to see where I was) I kept plodding by! I stopped at some point – needed some energy – can’t remember when that was, though I think it was before café Reynard which is about 6k from the top…. Pretty sure Nancy had passed me again by then! At café Reynard I didn’t stop – I needed to keep going – the last bit is horrid – it’s very exposed & there’s no getting away from the fact that you can pretty much always see the top – I don’t like to see the summit – it messes with your head …. And it did…. I began to wonder if I could achieve it. A load of people who’d already made it, were heading down to round up us stragglers – the group photo at the summit was important…. Dave was FAB – I could hear people calling my name, I couldn’t see them – it’s a bit busy up there! Anyhoo, I had a Power Bar wafer & had some drink (pretended to look at the view) and then got back on the bike. Group picture – achieved once Van managed to catch us up – Unfortunately Tracey’s knee wouldn’t let her get past 6½ miles. So Van went back to the campsite with her & then came up. All credit to him as it wasn’t too much longer after me!. The walker came up, probably ¾-1 hour after me & came over & shook Ian’s & my hand – which was kind – obviously provided him with enough ‘in-flight’ entertainment to get him to the top! I love the downhill bits – it’s the only reason to go. Photo taken & it was down to Malecene & back to the campsite…. We had another 3 days to fill – one thing I knew for certain – day 2 wouldn’t involve a bike for me – I was off to Avignon to look at the bridge & Papal Palace – I’ve not quite entered the world yet – I still have to do ‘normal’ stuff as well!! Great blog. 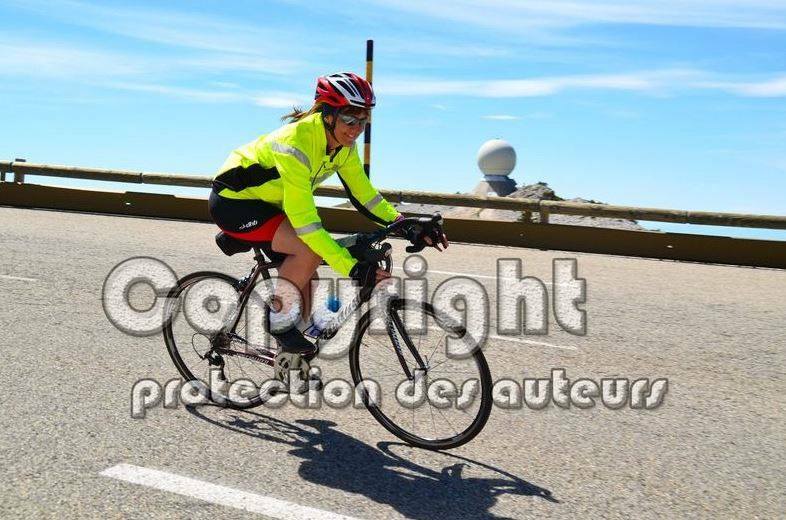 I climbed Ventoux a couple of years ago. It was my first big venture into the famous Tour de France climbs, and all the reading, reasearch and psyching up can’t prepare you what it’s like. Great achievement!